This summer might already be over with Christmas now on the horizon, but that doesn’t mean it’s too early to start thinking about next year’s adventures. Especially now with 2014 Singapore Public Holiday dates confirmed, it is time to plan for vacations around the public holidays. With careful planning, you will just need to take 4 days of vacation leave for 31 days of rest! 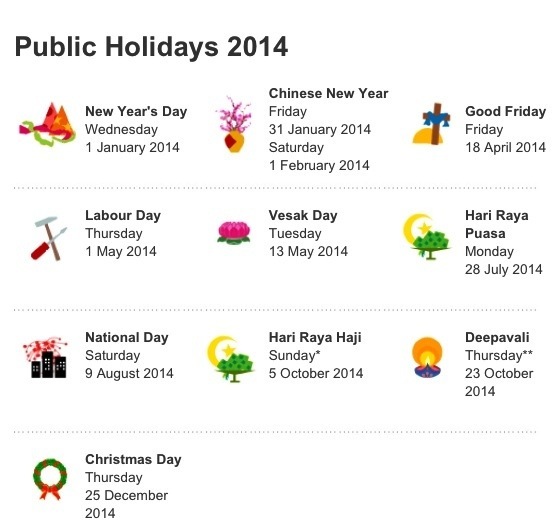 Four out of the 11 public holidays fall on Friday, Sunday or Monday, yielding four long weekends – the first day of Chinese New Year, Good Friday, Hari Raya Puasa and Hari Raya Haji. Taking another four days of leave bring the count up to eight. These would be the days before or after Vesak Day, Labour Day, Deepavali and Christmas, which all fall on Tuesday or Thursday. Perfect for a short getaway to nearby countries e.g. shopping trip in Bangkok or a beach holiday in Cebu. In fact, you can plan much longer holidays in Europe that straddles over 2 holidays – Labour Day and Vesak Day – enough for a 2-week trip and taking just 9 days of vacation leave! Towards the end of December and the beginning of January, we often need something to perk us up as the post-Christmas blues kick in. A trip to the travel agent should be at the top of our feel-good agenda. However, with January and February one of the busiest times to book holidays for the upcoming summer, you could beat the rush by booking holidays 2014 with brands such as Monarch Airlines now! It’s understandable that you don’t want to spend a fortune on your holiday when you’ve got an army of people to buy Christmas gifts for, but you can often secure your summer holiday with just a small deposit. This gets your summer trip locked in but doesn’t eat into your Christmas spending money. Package holidays made a bit of a comeback this year. After all the worry about airlines going bust and hotels closing up, you can be sure you’re protected when you book an ATOL protected holiday. Get in early before they sell out and you’re forced to piece your own holiday together. By spring next year all the good deals will have gone. That’s even more important if you’re booking during the break from school as the prices tend to sky rocket. Book before Christmas and you’ll be more likely to get a family holiday without the huge price tag. Do you hate it when the only flights with available seats depart at some ungodly hour of the morning? If you want to avoid having to drag yourself out of bed at 3am, book early! You’ll get access to all the flights and will be able to choose a much more convenient flight time for you and your family. Similar to choose a more convenient flight time, by booking in advance you can also get the best seats by pre-selecting them. Whether you prefer the convenience of the aisle seat or the fantastic viewing opportunities afforded by a window seat, booking early can ensure you’re not disappointed. By booking your summer holiday now, you’ll not only get these benefits but may even find a cheaper deal too. No one can guarantee the best prices but booking at certain times gives you a better chance of finding a bargain family holiday. Nice article. We should really plan ahead to enjoy and not just work all year.